Southeast Asia has been inhabited since the Neolithic era, but the seeds of Angkorian civilization were sown in the 1st century CE. At the turn of the millennium, Southeast Asia was becoming a hub in a vast commercial trading network that stretched from the Mediterranean to China. Indian and Chinese traders began arriving in the region in greater numbers, exposing the indigenous people to their cultures, though it was Indian culture that took hold, perhaps through the efforts of Brahman priests. Indian culture, religion (Hinduism and Buddhism), law, political theory, science and writing spread through the region over a period of several centuries, gradually being adopted by existing states and giving rise to new Indianised princedoms. Though the newly Indianised princely states sometimes encompassed large areas, they were often no larger than a single fortified city. They warred among themselves, coalescing over time into a shifting set of larger states. According to 3rd century Chinese chronicles, one of China’s principal trading partners and a dominant power in the region was the Indianised state of Funan centered in today’s southern Vietnam and Cambodia. There is evidence that the Funanese spoke Mon-Khmer, strongly indicating a connection to later Angkorian and Cambodian civilization. Funan was predominate over its smaller neighboring states, including the state of Chendla in northern Cambodia. Over the later half of the 6th century, Funan began to decline, losing its western territories. 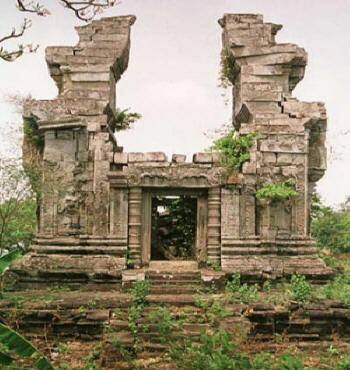 Chendla, already in the ascendant, conquered the Khmer sections of western Funan, while the Mon people won the extreme western section of Funan in present day Thailand. Later, Chendla seems to have gone on to conquer the remainder of Funan, signaling the beginning of the ‘pre-Angkorian’ period. Chendla flourished but for a short time. 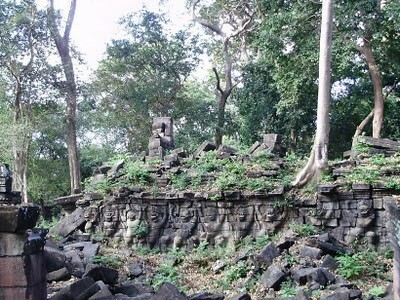 The third and last king of a unified Chendla, Isanavarman I, constructed the pre-Angkorian temples of Sambor Prei Kuk near modern Kampong Thom city. (If you come to Siem Reap from Phnom Penh by road, you will pass through Kampong Thom. With a few spare hours, it is possible to make a side trip to these pre-Angkorian ruins). Under Isanavarman I’s successor, Chendla disintegrated into smaller warring states. It was briefly reunited under Jayavarman I in the mid-7th century, only to fall apart again after his death. On traditional accounts, Chendla finally broke into two rival states or alliances, ‘Land Chendla’ in northern Cambodia/southern Laos, and ‘Water Chendla’ centered further south in Kampong Thom. 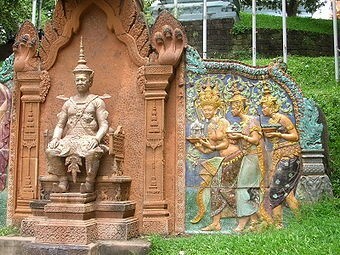 Jayavarman II was the first king of the Angkorian era, though his origins are recorded in history that borders on legend. 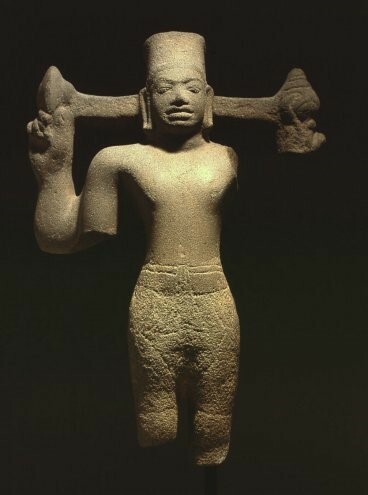 He is reputed to have been a Khmer prince, returned to Cambodia around 790CE after a lengthy, perhaps forced stay in the royal court in Java. Regardless of his origin, he was a warrior who, upon returning to Cambodia, subdued enough of the competing Khmer states to declare a sovereign and unified ‘Kambuja’ under a single ruler. He made this declaration in 802CE in a ceremony on Kulen Mountain (Phnom Kulen) north of Siem Reap, where he held a ‘god-king’ rite that legitimized his ‘universal kingship’ through the establishment of a royal linga-worshiping cult. 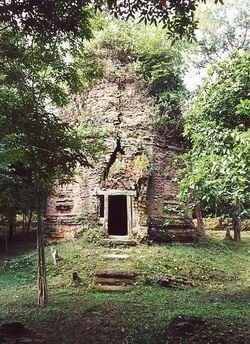 The linga-cult would remain central to Angkorian kingship, religion, art and architecture for centuries. After 802CE, Jayavarman II continued to pacify rebellious areas and enlarge his kingdom. Before 802CE, he had briefly based himself at a pre-Angkorian settlement near the modern town of Roluos (13km southeast of Siem Reap). For some reason, perhaps due to military considerations, he moved from the Roluos area to the Kulen Mountains. Some- time after establishing his kingship in 802CE, he moved the capital back to the Roluos area, which he named Hariharalaya in honor of the combined god of Shiva and Vishnu. He reigned from Hariharalaya until his death in 850CE. Thirty years after Jayavarman II’s death, King Indravarman III constructed the temple of Preah Ko, the first major member of the ‘Roluos Group’, in honor of Jayavarman II. He then constructed Bakong, which was the first grand project to follow the temple-mountain architectural formula. When visiting these temples, note the deep, rich, detailed artistic style in the carvings that were characteristic of the period. 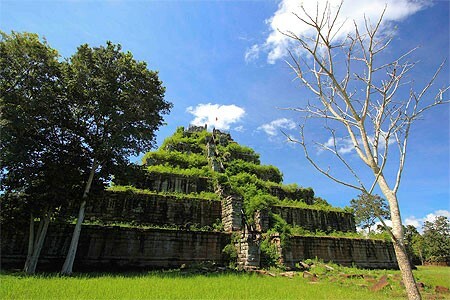 Indravarman III also built the first large baray (water reservoir), thereby establishing two more defining marks of the Angkorian kingship - in addition to the linga-cult, the construction of temple monuments and grand water projects became part of kingly tradition. Indravarman III’s son, Yasovarman I, carried on the tradition of his father, building the East Baray as well as the last major temple of the Roluos Group (Lolei), and the first major temple in the Angkor area (Phnom Bakheng). Upon completing Phnom Bakheng in 893CE, he moved his capital to the newly named Yasodharapura in the Angkor area. The move may have been sparked by Yasovarman I’s violent confrontation with his brother for the throne, which left the Royal Palace at Roluos in ashes. With one exception, the capital would reside in the Angkor area for the next 500 years. The exception took place in 928CE when, for reasons that remain unclear, there was a disruption in the royal succession. King Jayavarman IV moved the capital 100km from Angkor north to Koh Ker, where it remained for 20 years. When the capital returned to Angkor, it centered not at Phnom Bakheng as it had before, but further east at the new state-temple of Pre Rup (961CE). An era of territorial, political and commercial expansion followed the return to Angkor. 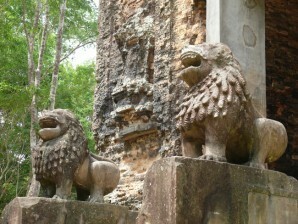 Royal courts flourished and constructed several major monuments including Ta Keo, Banteay Srey, Baphuon, and West Baray. Kings of the period exercised their military muscle, including King Rajendravarman who led successful campaigns against the eastern enemy of Champa in the mid 10th century. Just after the turn of the millennium, there was a 9-year period of political upheaval that ended when King Suryavarman I seized firm control in 1010CE. In the following decades, he led the Khmer to many important military victories including conquering the Mon Empire to the west (capturing much of the area of modern Thailand), thereby bringing the entire western portion of old Funan under Khmer control. A century later, King Suryavarman II led several successful campaigns against the Khmer’s traditional eastern enemy, Champa, in central and southern Vietnam. Under Suryavarman II in the early 12th century, the empire was at its political/territorial apex. Appropriate to the greatness of the times, Suryavarman II produced Angkor’s most spectacular architectural creation, Angkor Wat, as well as other monuments such as Thommanon, Banteay Samre and Beng Melea. Angkor Wat was constructed as Suryavarman II’s state-temple and perhaps as his funerary temple. Extensive battle scenes from his campaigns against Champa are recorded in the superb bas-reliefs on the south wall of Angkor Wat. By the late 12th century, rebellious states in the provinces, unsuccessful campaigns against the Vietnamese Tonkin, and internal conflicts all began to weaken the empire. In 1165, during a turbulent period when Khmer and Cham princes plotted and fought both together and against one another, a usurper named Tribhuvanadityavarman seized power at Angkor. In 1177 the usurper was killed in one of the worst defeats suffered by the Khmers at the hands of the Cham. Champa, apparently in collusion with some Khmer factions, launched a sneak naval attack on Angkor. A Cham fleet sailed up the Tonle Sap River onto the great Tonle Sap Lake just south of the capital city. Naval and land battles ensued in which the city was assaulted, burned and occupied by the Cham. 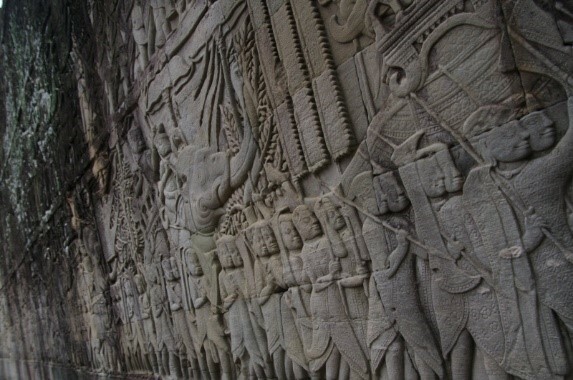 The south wall of Bayon displays bas-reliefs of a naval battle, but it is unclear whether it is a depiction of the battle of 1177 or some later battle. The Cham controlled Angkor for four years until the legendary Jayavarman VII mounted a series of counter attacks over a period of years. He drove the Cham from Cambodia in 1181. After the Cham defeat, Jayavarman VII was declared king. 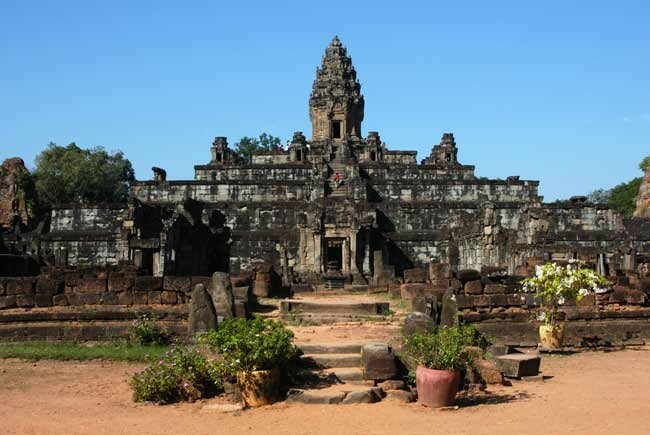 He broke with almost 400 years of tradition and made Mahayana Buddhism the state religion, and immediately began Angkor’s most prolific period of monument building. Jayavarman VII’s building campaign was unprecedented and took place at a frenetic pace. Hundreds of monuments were constructed in less than a 40-year period. 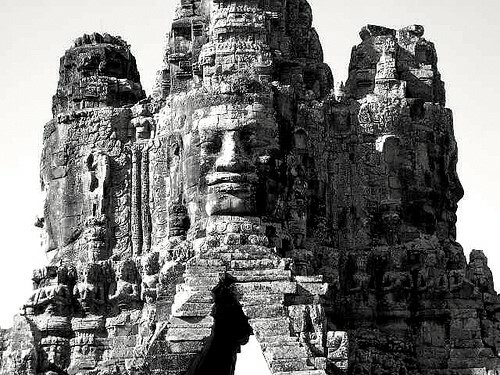 Jayavarman VII’s works included Bayon with its famous giant faces, his capital city of Angkor Thom, the temples of Ta Prohm, Banteay Kdei and Preah Khan, and hundreds of others. The monuments of this period, though myriad and grand, are often architecturally confused and artistically inferior to earlier periods, seemingly due in part to the haste with which they were rendered. Jayavarman VII’s prodigious building campaign also represents the finale of the Khmer empire as no further grand monuments were constructed after his death in 1220. Construction on some monuments, notably Bayon, stopped short of completion, probably coinciding with Jayavarman VII’s death. His successor, Indravarman II continued construction on some Jayavarman VII monuments with limited success. Though the monument building had come to a halt, the capital remained active for years. Chinese emissary Zhou Daguan (Chou Ta-Kuan) visited Angkor in the late 13th century and describes a vibrant city in his classic, ‘Customs of Cambodia’. Hinduism made a comeback under Jayavarman VIII in the late 13th century during which most of Angkor’s Buddhist monuments were systematically defaced. Look for the chipped out Buddha images on almost all of Jayavarman VII’s Buddhist monuments. Literally thousands of Buddha images have been removed in what must have been a huge investment of destructive effort. Interestingly, some Buddha images were crudely altered into Hindu lingas and Bodhisattvas. There are some good examples of altered images at Ta Prohm and Preah Khan. Top in Angkor Thom. 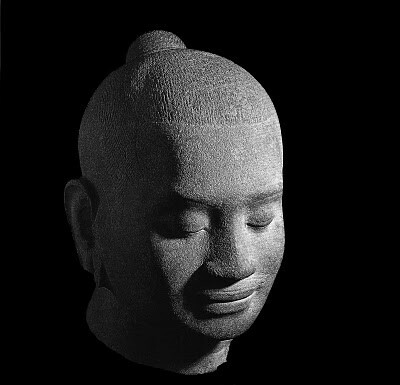 After Jayavarman VIII’s death, Buddhism returned to Cambodia but in a different form. 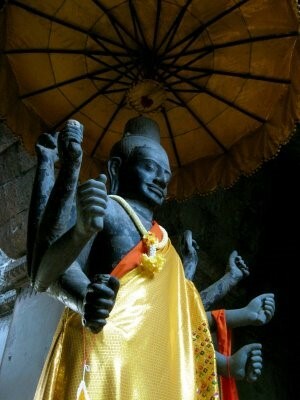 Instead of Mahayana Buddhism, Theravada Buddhism took hold and remains the dominant religion in Cambodia to this day. 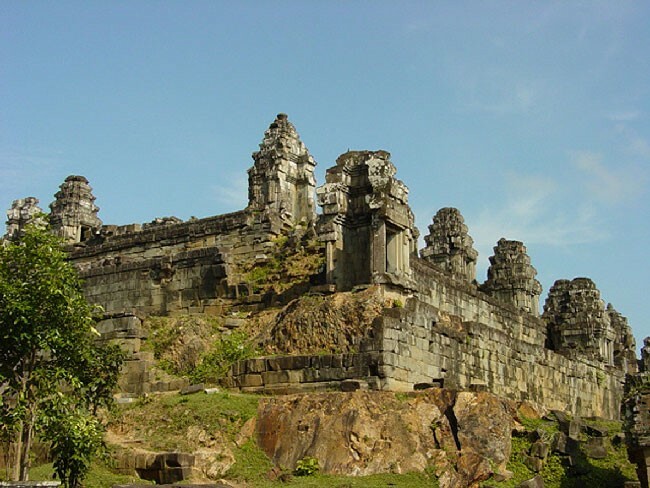 After the 13th century, Angkor suffered repeated invasions by the Thai from the west, pressuring the Khmer and contributing to the capital being moved from Angkor. After a seven-month siege on Angkor in 1431, King Ponhea Yat moved the capital from Angkor to Phnom Penh in 1432. This move may also have marked a shift from an agrarian-based economy to a trade based economy, in which a river junction location like Phnom Penh rather than the inland area of Angkor would be more advantageous. After the move to Phnom Penh, the capital of Cambodia moved a couple of more times, first to Lovek and then Oudong, before finally settling permanently into Phnom Penh in 1866. 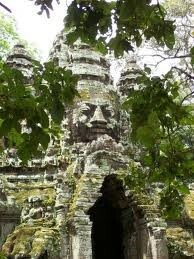 After the capital moved from Angkor, the temples remained active, though their function changed over the years. Angkor Wat was visited several times by western explorers and missionaries between the 16th and 19th century, but it is Henri Mouhot who is popularly credited with the ‘discovery’ of Angkor Wat in 1860. His book, ‘Travels in Siam, Cambodia, Laos and Annam’ is credited with bringing Angkor its first tourist boom. .